Handling Tips: Store whole, uncut melons up to 5 days at room temperature. Wrap cut melons in plastic and refrigerate up to 3 days. General Information: These melons are small, about the size of medium papaya. They taste like cantaloupe, but with firmer flesh. They are an elongated-oval fruit with a bright yellow and white smooth skin that is ribbed. The flesh is white, crispy and aromatic. Korean Melon has a small cavity with numerous seeds and is a member of the gourd family. Nutritional: The Korean Melon contains vitamin A, C and calcium making it an effective fruit for skincare and diuretic. Kukulbitasin contained in melon has been proved to have resistance against cancer and prevent cancer from spreading. In herbal medicine, it is known to cure coughs and phlegm. Melons are also good for digestion and curing constipation. Applications: Eat fresh in wedges or cube and add to fruit salads. Korean Melon can be prepared and used as an edible garnish or served with ice cream. History: The Korean Melon is believed to be introduced through China in the period of the Three Kingdoms, and with it's particular fragrant and taste, it is renowned summer fruit together with watermelon. Every year, the cultivation has increased. During the mid 1950's Yeomcheon was introduced from Japan and was interlaced with the existing type of melons, and existing type of melons lost it's particular character. 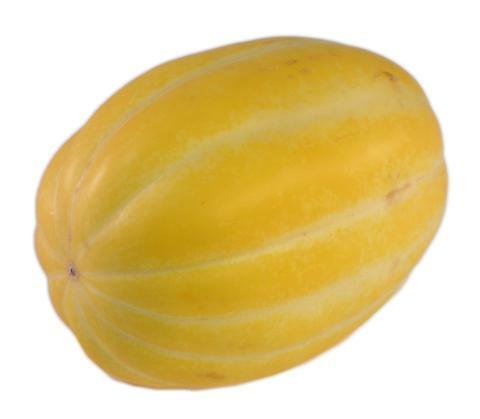 While the existing melons were low in sweetness, Yeomcheon melon had high sugar contents and were easier to transport. Yeomcheon melon were replaced fast, and from 1960's onward, it became the main kind of Korean melon.